A Tonk's Tail... err, Tale...: Get a Jump on Fragrance Free Day with a Giveaway! Eco-friendly pet company SeaYu Enterprises is hosting its third annual Fragrance Free Day tomorrow. But should you go fragrance free? Considering how powerful – and sneeze worthy – some scents can be, maybe it’s not such a bad idea. As a shelter volunteer, I’ve seen firsthand how our pets can suffer from allergies, too. To get the ball rolling for Fragrance Free Day, SeaYu Enterprises is giving away up to three - count’em three! - of their Clean+Green products from their online store to one lucky winner. Go to SeaYu's Clean+Green online store and choose which item (up to three) that you would like to try. Comment below with your name and email address, telling us how you'll use the product. To protect you from spam, be sure to enter it as "name(at)email(dot)com". You'll find several other ways to win below, in our awesome Rafflecopter widget. And feel free to join founder Quincy Yu in a live twitter chat tomorrow from 1-2 PM EST to learn more about the potential hazards in everyday household items that contain fragrances. Disclaimer: I was not compensated in any way to host this raffle. Clean + Green graciously donated the product for the giveaway. Winners have 48 hours to respond once notified, or another winner will be chosen. That sounds like a very good product. Would love to get a review on them. Oh - those look interesting. Mom is always on the lookout. She keeps letting woofies in the car (sigh) and she wants to be careful around us and the foster monsters. :) We are so in!! Some fragrances are also toxic to us if we step in them and lick our paws. Agreed! You wouldn't believe the things Mom found as se researched this (she wouldn't offer this up even as a giveaway until she first did some background research on animals and fragrance. And what she found...? Let's just say there's a fragrance Medical Monday post looming in our future...! It’s a minefield for kitties!! That is darn good stuff and we lovenit here! 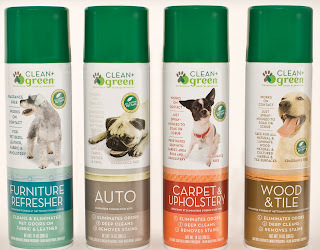 We love Clean + Green! Our mom tried Clean + Green with Sweet Praline and really liked it. We'd love to win some for us. We could use the carpet and wood floor stuff. Of course, the litter box stuff is very important and needed.